Sixty percent of the owners turned out in this year's election and budget vote. This is the tenth consecutive vote above 60% participation. By comparison, voter turnout was 54% for the 2016 presidential election and is 10% - 20% for most HOA's. Joe Sandifer of Precision Management and Candi Gianuzzi (retired board member) independently monitored the election and counted the votes separately of each other. After the polls closed, the monitors/counters compared results, performed recounts where they deemed appropriate, certificated the tally and edited/approved a draft of this report. The ballots (in a signed and sealed envelope as per state law) will be delivered to the acting-President, Jesse Mitchell, for archiving. 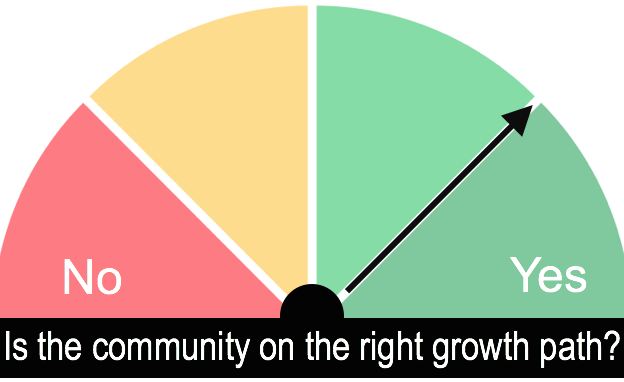 Is the community on the right path: The association scored a "2" on a scale of 1-5 for the third year in a row (see chart). Only three owners voted in the "not so much" or "no" categories. Assessments for 2019: Assessments will be $316 a quarter, comprised of $283 to cover mandatory expenses and reserves (a 4% increase over last year), a one year bump of $10.57 to cover the costs for the installation of security cameras in the mail room, and a two year bump of $22.86 to cover the cost of an automated traffic gate. 67% of voters approved the mandatory budget, 64% approved the costs for a security camera, and 77% approved the cost of the security gate. Directors: Robert Bauer (re-elected), Joeddie Cotledge (elected to first term), Brenda Madison (board member in the past), Jesse Mitchell (re-elected), and Ron Olson (elected to first term). The directors will meet and elect who will serve as officers on April 29th. Mandatory engineering and reserve study: The 2018 long term capital spending plan (2019 - 2040) was approved by a vote of 84%, with 16% voting for the hiring of an outside engineering firm to redo the study. Amendment 1: Towing anyone who street parks (without notice) was approved with a 69% majority. This is a fire safety initiative. No action will be taken until the board circulates the protocol to owners. Security Camera. Owners approved security cameras for the mail room in a vote, 64% to 36%. This is a security initiative. Gate: An exit gate was approved 62% to 38%. The gate will block foot and vehicle traffic and owners will open it from a device in our cars. This would end walk-through and drive-through traffic in the community. This is final resolution on a 4 year discussion on "gate or no gate" and "entry or exit" gate with 69% agreeing that we should accept the decision of the majority. The entry "gate arms" will remain in place to make it clear that the subdivision is private roadway (not public). Bookkeeper Performance: 77% had no opinion or were favorable of Guardian Management. Twelve rated the bookkeeper as "not good".